June 1, 2018. Several years ago I skated across the lake near which my office sits and found a lovely patch of the ancient Midwest. It was a sedge meadow—a place where life had gone on pretty much as it always had for several hundred years. That’s a rare thing to say in America. Everything changes so much and so fast that, to say something has stayed about the same for even a hundred years, or even a couple decades, is to make a bold claim. It just doesn’t happen, except with government buildings, historical monuments, and iconic geological features like Half Dome in Yosemite. 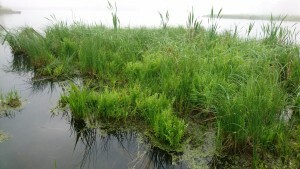 This little sedge meadow was wedged in a corner of McMahon Lake in Scott County, Minnesota. When I saw it, covered in snow, the arching narrow leaves of its sedges frosted and glinting in the slant sunlight, I let out a whoop. Nearly every wetland in the Midwest is the exact opposite of the sedge meadow I viewed that winter’s afternoon. Wet meadows are usually blanketed in a uniform coat of one or a couple of plant species imported or blown in from elsewhere. There’s the Southeast Asian blend of reed canary grass, hybridized in England to dominate wetlands with its vigorous growth so that North American farmers could hay it or graze it hard and long. There’s narrow-leaved cattail and its giant hybrid formed by mixing genes with the local and well-behaved broad-leaved cattail. Narrow-leaved cattail was borne hither on the coattails of commerce—up the St. Lawrence River from the Atlantic coast, spreading along the coastlines of the Great Lakes and up the rivers that penetrated the country’s heartland. Wind, water, and moving objects—vehicles, people, animals—did the rest. Then there’s giant reed, aptly named as it consumes thousands of acres of marshland by towering over and shading to the point of disappearance every other plant that might grow there. Giant reed is cosmopolitan—growing on ocean coasts worldwide—but only becoming a global harm when commercial transportation of goods (again) inadvertently mixed and matched its genetic code to produce super-plants taking over the world’s coasts. As you can imagine, when these plants get a toehold somewhere new—not only having escaped the pests and viruses of their old haunts, but being supercharged by fortuitous breeding—they outcompete everybody else. These are not isolated cases, but a full-on assault against the natural biodiversity of the North American continent. In the 1930s, with twin disasters of the Great Depression and Dust Bowl in full swing, the federal government sent agents of the Soil Conservation Service to scour the planet for plants to bring back and stabilize the Great Plains—whose topsoil inconveniently was being scooped up by ferocious winds every couple of months and delivered in layers across the Eastern United States as far as Washington DC and New York City. (The cause of this was new technology married to speculative capital looking for a place to make money—but that’s another story.) The federal agents brought back plants that were aggressive, could tolerate extreme conditions, and would spread like mad. Voilà—designer invasive plants, like smooth brome grass, that were spread far and wide not only to stabilize soil, but as part and parcel of every development project thenceforth. Not surprisingly, these introduced plants spread to places they were not intended for, like sedge meadows, native prairies, savannas, forests, and so on. Yet, to return to me standing on my ice skates in subzero temperatures absorbed by the sight of sedge leaves shining, here they had not arrived. How was this possible? What a rare sight, then, and just minutes by skates, or seconds on a snowmobile, or perhaps ten or fifteen if swimming the Australian crawl…in short, just a little ways from my office, here it was. In a hurry to reach my desk and start my day, I caught out of the corner of my eye an unfamiliar chunk of shoreline at the neighbor’s—a swatch of green pressing into the lake where I’d not recollected that chunk existing before. “Wonder what happened there? Did they clear the trees and shrubs and now we see that part of the shore?” I thought. 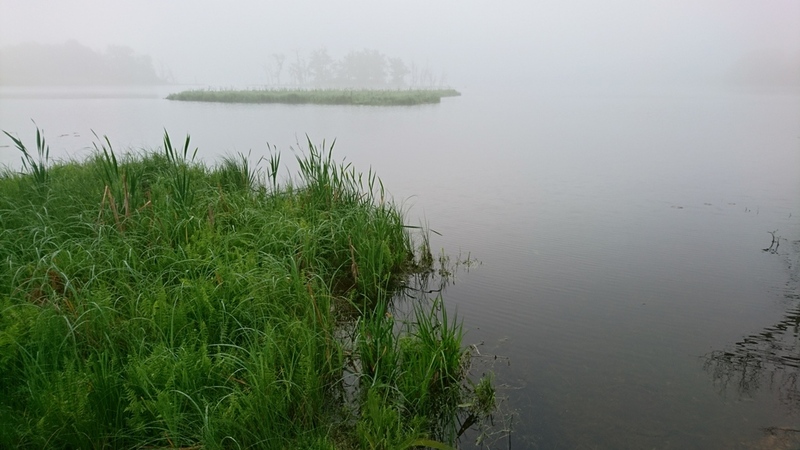 A couple hurried days later, coming around the downward-sloping curve in the road, I was surprised by a new island in the lake, offshore from the neighbor’s place. What the heck!? I slowed, pulled into the public boat launch, and got out. What I saw astounded me. I’d heard of this kind of thing happening. I’d even seen something similar involving narrow-leaved cattails. But never had I witnessed the magic of a once common natural phenomenon now rare or absent. It was kin to experiencing the thunderous flow of a bison herd, rushing whoosh of a passenger pigeon flock, vast sweeping glow of a prairie fire at night, emergence of a hundred million seventeen-year cicadas, and the other massive natural events now dwindling on the planet as the human enterprise expands. Ok…clearly not on that scale…but what I beheld was something you have never seen, and that I had never seen to that moment, but knew existed. It was a floating sedge mat, or floating bog mat, broken free from its mother ship, like a calving iceberg, and now wandering around the lake looking for a shore to bond with. I mentioned narrow-leaved cattail islands floating around. I’d seen some break free from the shore, floating on air-filled roots that had tangled and gathered in dead stems from previous year’s growth—creating an integrated mat that moved around like a boat blown by the wind. They eventually came to rest on some shoreline to bind with the vegetation there and begin anew. I’d heard about bog islands, chock full of native plants, breaking free of their moorings on remote northern lakes. Now here was a sedge mat, journeying from its home in the northeast corner of McMahon Lake, propelled by the wind to the opposite lake shore. Crazy! As I watched, it moved ever so slowly northward on the back of a south wind. 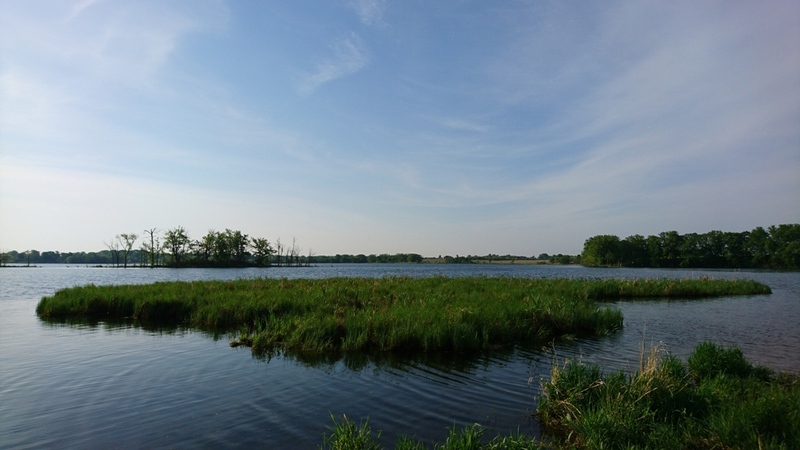 If the wind held, it would reach the northwest shore of the lake and make contact with a large prairie that the Soil and Water Conservation District had planted some years before. If that came to pass, a wonder would appear not seen hereabouts for 150 years—namely, a piece of uplands dominated by native plants growing next to a piece of wetlands dominated by native plants. That upland to wetland continuum used to be common as dirt…or more properly, as common as the millions of acres of prairie to sedge meadow continuum once was. That is something to be happy about. The reason is this. So many animals depend on the hundreds of plants found in natural wetlands and nearby wild uplands. Animals like certain butterflies and moths, frogs and toads, and others yet unknown. 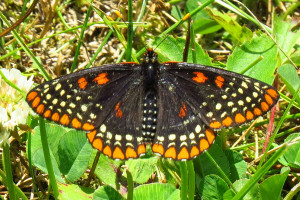 (See https://wisconsinbutterflies.org/butterfly/species/80-baltimore-checkerspot for a stunner of a butterfly with this life story.) If the sedge mat met the tallgrass prairie on the shores of McMahon Lake, it would be as if somebody had found the missing piece in a jigsaw puzzle lying unfinished on a card table for over a hundred years and put it where it belonged. Imagine the feeling of satisfaction. Imagine the relief! Now you can stop fretting about that missing piece of the puzzle and get on with things.